[Dave Birch] I was writing something about mobile payments when I began to think that the way that we use phones for things like payments is still pretty new, and that we probably don’t envisage how they will be used in the future, in the sense that while I can see how the technology might work, I’m still not sure how it will be used. Will people be tapping their phones together? Will we want to? Will it seem odd to meet someone new and not touch your phone to their phone? If you get a busy signal, it does not mean that the person you are trying to reach does not wish to speak to you, or that the operator is being rude or lazy. The key resource in this field is Claude Fisher’s “America calling: a social history of the telephone to 1940“. He gives a fascinating tour through the evolution of telephone etiquette. It strikes me that people felt about the telephone then they way they feel about Facebook now: allowing strangers to call your wife, servants and children without you at “gatekeeper” would inevitably lead to social breakdown. People wondered what was acceptable, and what wasn’t. In 1914, one Florence Hall wrote about telephone etiquette and advised strongly against inviting people to anything over the phone because “the person invited, being suddenly held up and the point of a gun, as it were, is likely to forgot some other engagement”. In the 19th century, arguments about whether the telephone was the friend of the criminal or the friend of the policeman adumbrate exactly the same debates about the internet a decade ago and social networking today. Another factor was that the telephone companies saw their business as linking businesses, or as linking businessmen to their homes, they did not see the potential for domestic interconnection and, specifically, the use of the phone by women in that context. In “Hello Central? : Gender, Technology, and Culture in the Formation of Telephone Systems, Michele Martin says that the early structure of the domestic telephone networks shows that they were primarily used within friendship circles, which expanded as new exchanges were opened. We probably don’t see the telephone as social media, but it was. The point is that the social impact of the communications technology was not something planned by the developers. It takes time for new communications technology to really become part of the fabric of society, and I don’t believe we’re there yet when it comes to social media, mobile phones, games consoles or, for that matter, the internet itself. Presumably someone is writing a book a Facebook etiquette? [Dave Birch] The number of times I’ve found myself enraged by the expense of wifi — in a hotel, at a train station, wherever — is huge, but I think becoming slightly rarer. Apart from hotels, where the wifi charges are absolutely ridiculous, the situation is improving. I’m still curious, though, why free wifi isn’t more widespread. I tend to do this too. I think I prefer Caffe Nero coffee at the moment, and they have contactless payment terminals too (which ought to work faster than cash, but don’t, because of the way they are configured), but because I have a Starbucks card I can sit and get some work done using the free wifi. I really don’t understand why all coffee shops don’t just provide free wifi and be done with it and then get back to competing on coffee. Although I suppose there are other things to compete on still. The theory, presumably, is that other than at peak times there is always room to sell another cup, a piece of cake, a biscuit for people who want to stop and work/read/relax. The next logical step would be to have iPads built in to the tables for people who want to read the news and browse around. Presumably it would be cheaper to negotiate a global deal with News International instead of messing about printing, delivering and returning copies of the The Times. (Like many people, I’m sure, I pick up my copy to read in the queue and while I’m waiting for my coffee, but I never buy it and leave it at the pick-up point.). 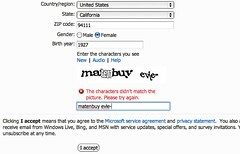 [Dave Birch] I hate the stupid “captcha” codes that some web sites use to determine whether you are person or a spam bot when logging in to a web site. Earlier todsy I had to create yet another Windows Live ID because I’d forgotten what my old one was. Why Windows Live can’t use OpenID I don’t know, but instead it forces you to mess about entering the same old data over again. Stupid. What’s more, because I couldn’t figure out what the captcha code actually was, I took me four attempts to finally log in correctly. I mean what on Earth does this say??? This provides no security at all, of course, because the spammers already have software that can read captcha codes better than I can, so what’s the point? Surely it would be easier for Windows to accept OpenID log ins from sites that have already made people jump through hoops to prove that they are actually people. [Dave Birch] Here’s an example. I just paid £17.38 for “Bernie Plays Rory” by Bernie Marsden. Why? Because I wanted it and couldn’t find it on iTunes. There was no need to try and find a pirate version to see if I played it a few times because I already knew that I wanted it. Why? Because there’s a track on there that I love and often play in the car. Why? Because I have it on a recording of the Paul Jones show on BBC Radio 2 that I downloaded. Why? Because I often listen to Paul Jones to find new music, but I listen to him when I’m cycling to work or in the car. If you subscribe to the BBC podcast of the show, it doesn’t have the music in (hilariously). I assume this is something to do with Big Content. So instead I found a piece of shareware that lets you download from iPlayer instead of having to listen on the computer. For months I have been using this to download the Paul Jones show to my iPhone. But now it doesn’t work any more, presumably because the BBC have changed iPlayer in some way. Well, there we are. I won’t be buying any more CDs from musicians like Bernie because I can’t listen to the Paul Jones show any more. Who does this benefit, exactly? male chess players choose significantly riskier strategies when playing against an attractive female opponent, even though this does not improve their performance. Women’s strategies are not affected by the attractiveness of the opponent. This seems to me to be as reasonable explanation as any as to why the banksters (bankster = banker who works for a privately-held bank that is “too big to fail”) took such absurd risks with other people’s money. As soon as women began appearing on trading floors, the male bankers were unable to control themselves and began putting ever-larger bets on ever-more absurd propositions that they didn’t really understand, confident in the knowledge that they had no downside. In the old days, when bankers were generally rather dull (but rather rich) men, the risks they took were proportionate. Now that bankers include attractive women, it’s all gone pear-shaped. I suggest that it is only a matter of time before the first lawsuit is filed by an out-of-pocket customer against a bank for employing women who are too attractive: perhaps this is what UBS has in mind with its new dress code that prohibits tight blouses, short skirts and black underwear. There’s already an agreed taxonomy for doing so – you take the ticker of the company, and precede it with a dollar sign. Thus Google is $GOOG, Apple is $AAPL, Microsoft is $MSFT. Search for postings about Google by sticking $GOOG into the search box and you get a page like this… So we need a way to add disclosures to tweets about companies, preferably one that doesn’t take up too much space and allows for some nuance. The post is asking for a similarly simple taxonomy for letting readers know if you are posting about a company that you have an interest in and it proposes a logical, but too complicated set. I commented: Actually, I think you’re probably right, although we need something simpler. I’ve got two ideas. There certainly ought to be a common mark for “my company provides paid services or products to the company that is the subject of this tweet”. Perhaps “@$”? So I might write “I see that @$VISA has announced their in2Pay product today” as distinct from “I see that $VISA has announced…”. There also needs to be a simple taxonomy for “I have a financial interest in the company that is the subject of this tweet. So perhaps “%” followed by the twitter name of the company. Thus I might write that %@chyppings is doing some ground-breaking work on mass-market NFC services, instead of the more neural @chyppings. This seems like a simple and desirable element of transparency that would add to the twitter experience. [Dave Birch] I think I’ve accidentally invented a new art form: “reality twitter”. It’s cheap, entertaining and infinitely better than reality TV. It happened by accident. I was on the Eurostar from Brussels and because I was really busy and trying to get a lot of work done, I was really annoyed that the guy behind me, who I couldn’t see, was yelling into his mobile phone. After a few minutes, though, I realised that what the guy was saying was actually quite interesting. I know it seems wrong to take advantage of another’s tragedy, but the story that was unfolding from the seat behind me had everything: excitement, suspense, drama and a little humour to. For a moment I thought idly that it was saving me the trouble of reading a novel and that gave me an idea – I started to listen to what he was saying, précis it and then post and anonymised version out on twitter. I did this every 10 or 15 minutes and in entirely unpredicted way it turned into a compelling read! That evening I was genuinely surprised to get messages from people, not just in the UK, asking me what had happened at the end of the story. I had to explain to them I didn’t know because I’ve been telling the truth: I had actually been reporting what was going on in the seat behind me on the train and when the train got to London that was the end of the story! So why was it compelling? Because it was real: he didn’t know that I was eavesdropping and (since we know that truth is stranger than fiction) most people reading knew that there was a real person behind it. So-called reality TV isn’t real at all: The Apprentice, I’m a Celebrity, those nauseating cooking shows, they are all a kind of theatre: the “contestants” know that they are being filmed and they are playing a game to “win”. That’s why the shows are so uninteresting (I know that some of my friends really like The Apprentice, so I’m sorry!). See my point! As tweets it worked, but as a conventional narrative it doesn’t. William Heath just start another story from his train and asked for a hashtag, so I suggested #realitytw as the twitterati’s alternative to reality TV! [Dave Birch] Yes, I know you’re not supposed to substitute anecdotes about your kids for real research, knowledge and insight into the future of society, but I’ve been reflecting on an exchange with my own Generation W (as in W for “whatever”) earlier in the day, and thought it was something worth sharing. It’s a small window into the near-term future of online communications. [Dave Birch] Well, I’ve got to say that I absolutely lurve my new MacBook Air. I got the small one, the 11-incher, and I just bought the entry level version with 2Gb RAM and 64Gb Flash. The MacBook Pro will remain my main machine, but it will only travel from my desk at home to my desk at the office. The rest of the time I’ll be carrying around a Kg of Air instead of 3Kg of Pro. It’s an absolute joy to use. It’s a full-sized keyboard, which I need, in a not-much-more than keyboard-size package. The screen is bright and clear. If 1366×768 sounds small to you, well it isn’t. I’ve been writing blog posts, editing documents and even working on presentations on it, all with no problem at all.